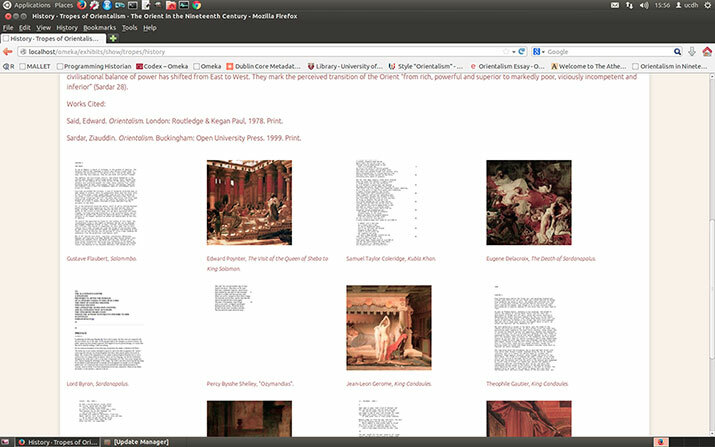 Justine utilised the web-publishing platform Omeka to give exposure to the relatively unexplored oeuvres of Elizabeth Siddal, Zelda Fitzgerald, and Yoko Ono – artistic muses to their more famous male counterparts. 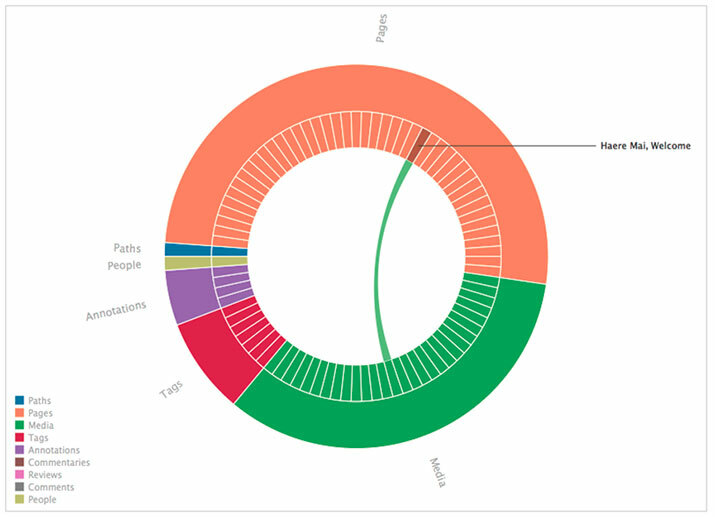 In her project, Justine employed the digital exhibition, interactive timeline, and content embedding features of Omeka to create a comprehensive collection of visual and textual resources relating to the three figures. Justine developed her Omeka site to function as a teaching resource, including in it: lesson plans, group activities, and a student guide for analysing, interpreting, and describing the works displayed on the site. 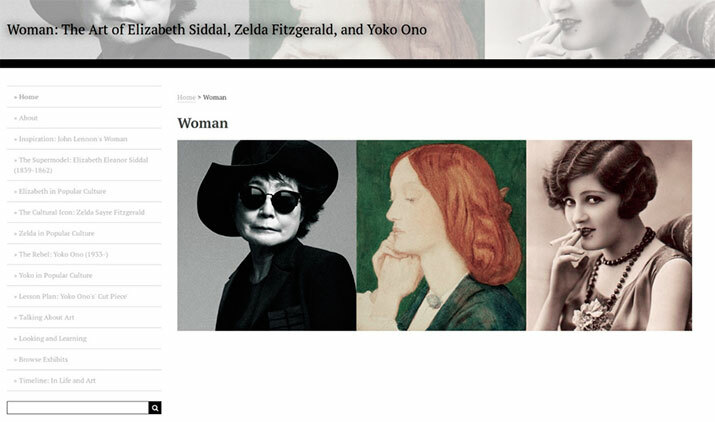 Women: The Art of Elizabeth Siddal, Zelda Fitzgerald, and Yoko Ono shows how web technologies can be used as an engaging pedagogical tool, acting as both a theoretical and visual resource for students studying art history. Lucy analysed the role of visualisation in augmenting, supporting, and problematizing the readings within the scholarly literature on Ari Folman’s 2008 film ‘A Waltz with Bashir’. Using the ImagePlot plugin for ImageJ developed by the Software Studies Initiative and other colour comparison tools, her project explored the potential that computational visualisation methods have to augment and support traditional modes of analysis, including studying the ways visual patterns relate to the film's generic hybridity and its complex engagement with issues of truth, fantasy and trauma. Alicia’s project was completed as part of a UC Arts internship. It involved developing a proof-of-concept website for the Macmillan Brown Library, to explore how the open source web publishing platform Omeka could be used as an online exhibition platform for bookplates from the library’s Special Collections. The project involved becoming familiar with the best practice standards surrounding metadata and data management, curation of images, learning basic CSS coding in order to alter the layout of the website, and testing various plugins to enhance the functionality of the website. Chloe used Scalar, a digital platform for online publishing, to build an online version of the Blue Oyster Arts Trust strategic plan. The project involved critically evaluating the value of online publishing within the GLAM sector management and testing ways in which Scalar’s semantic structure could be utilised to support the presentation of non-linear, multifaceted scholarly arguments. Chloe also explored how a Scalar publication could redefine and enable new ways of strategic thinking, and enhance the potential of electronic publishing in the GLAM sector. Jack’s project was an investigation into how scholarly digital archiving can contribute to the study of Orientalism, and more broadly, how digital tools can enable new approaches to traditional humanities issues. Using the open source web publishing platform Omeka, Jack created a comprehensive digital archive prototype, containing cultural products from nineteenth century Western Europe that depicted the Orient. This project involved scholarly research of cultural objects, web curation, becoming familiar with copyright laws and best practice standards surrounding metadata, and presenting a critical analysis of the digital archive in relation to issues of democracy and quality.